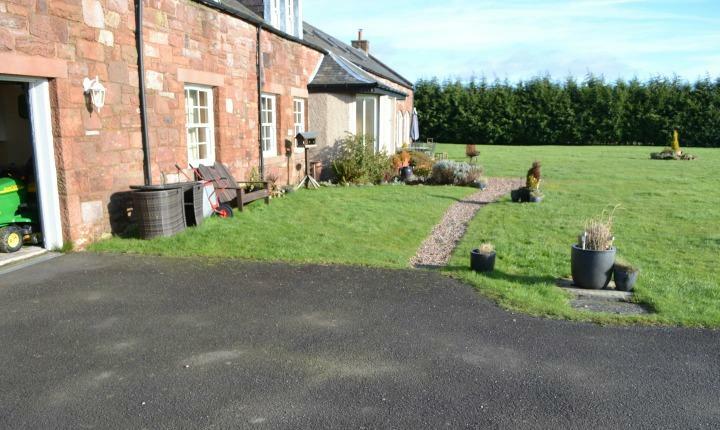 This paving project took place in the large country garden of a red sandstone steading in Aberargie. 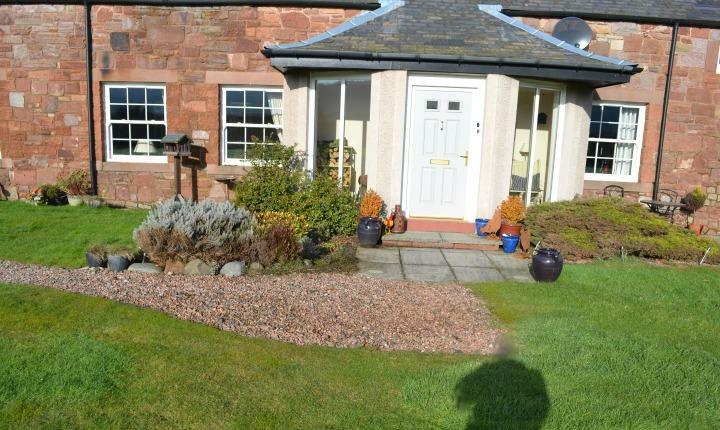 The existing garden was mainly laid to grass with a simple gravel path leading to the front door. 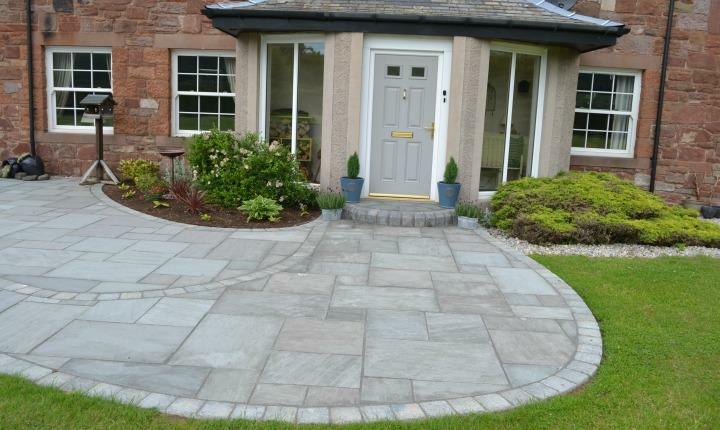 The clients wanted us to create a paved area at the front of the property not only to provide a seating and entertaining area but a smart new entrance to the property. 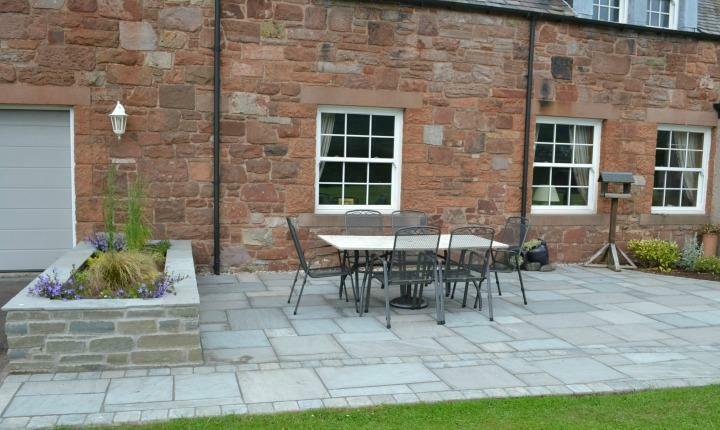 Grey sandstone slabs were chosen for practicality and to complement the style of the property. 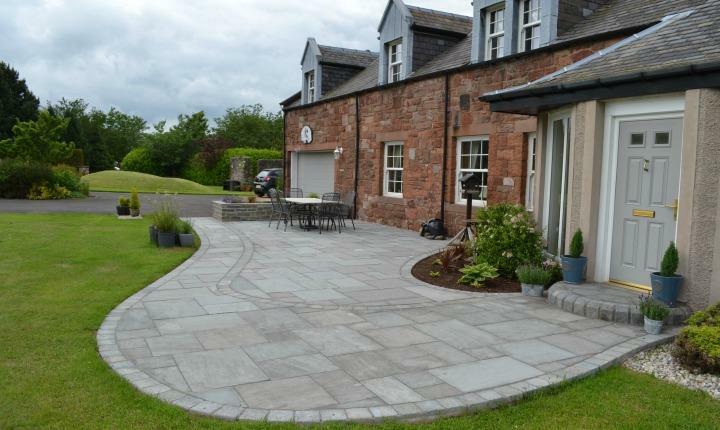 A large curved patio area was constructed, extending along the front of the property to the front door using grey sandstone slabs. Grey tegula blocks were inset in the paving to define the pathway to the front door and also used to edge the paving and border. 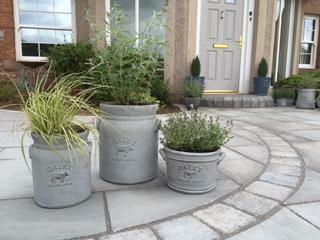 A smart new door step was constructed and edged with grey tegula kerbs. 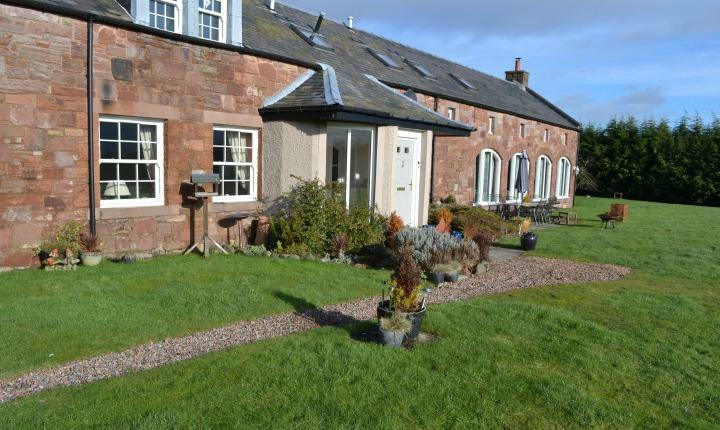 A large raised planter was constructed, faced with grey guillotined stone walling and finished with grey sandstone copings. 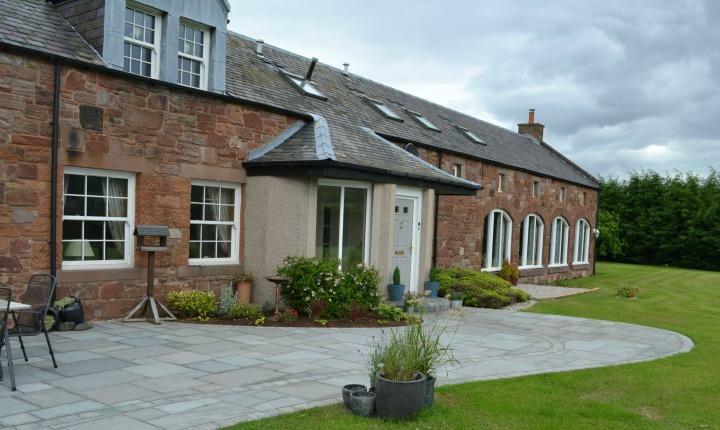 The materials chosen - grey sandstone and natural stone, complement the red sandstone steading and its countryside location perfectly. The sweeping curved paving provides a stunning new entrance to the property and a large area for relaxing and entertaining. The attractive raised planter adds height and can be planted up for interest throughout the year. 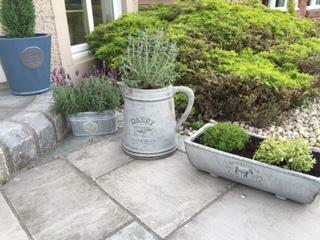 Well chosen planters and accessories added by the clients provide the finishing touches. We cannot recommend highly enough the whole team and the whole experience of working with Gardens Galore. From the first moment of contact when you phoned to say you had received our email we knew we had picked the right people for the job. With Gardens Galore we had fantastic communication throughout the whole project, from that first phone call and then subsequent visits to assess the work required, right up until completion. Your contract of work was very clear and precise and you certainly delivered on timing and expertise. 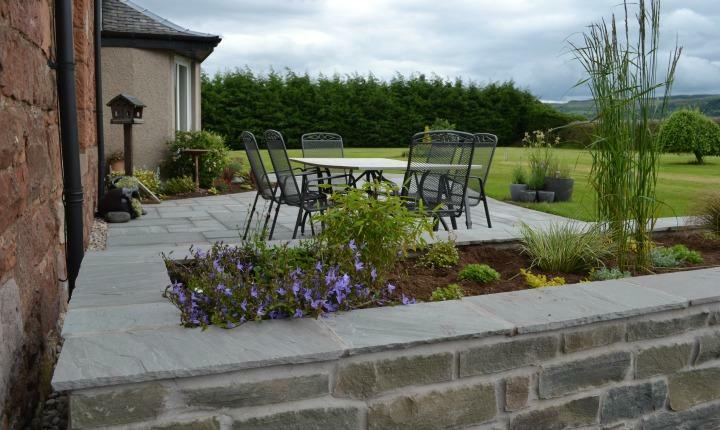 The landscaping team are a credit to the company and have made a fantastic job of our new patio, path and stone wall. Their customer care and attention to detail goes beyond all expectations. 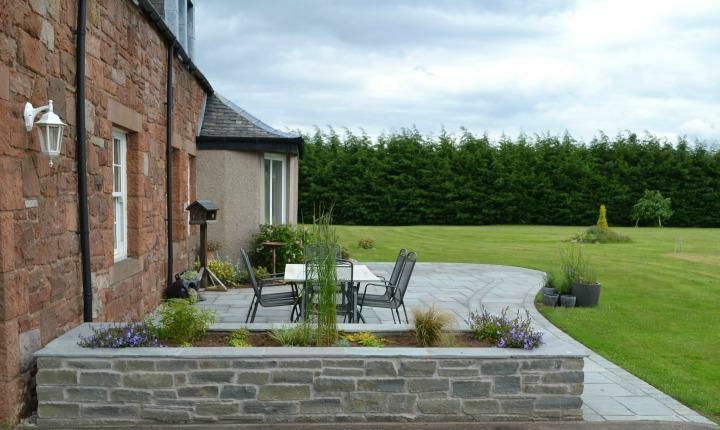 We are absolutely delighted with the whole experience of garden renovation and landscaping that you provided and look forward to contacting you again in the near future for the next stage!